The midrash tells us that the first human spent his time giving names to the animals. In Hebrew, of course, and he had fun playing with the letters and roots to convey their core essence. Take for example the dog, kelev, which literally means “like a heart” (ke-lev), portraying how loyal dogs are; or the arye, the lion, whose name is made of an alef – leadership and reish – head, emphasizing its role as king of the beast. ד וַיִּסְעוּ מֵהֹר הָהָר, דֶּרֶךְ יַם-סוּף, לִסְבֹב, אֶת-אֶרֶץ אֱדוֹם; וַתִּקְצַר נֶפֶשׁ-הָעָם, בַּדָּרֶךְ. 4 And they journeyed from mount Hor by the way to the Red Sea, to compass the land of Edom; and the soul of the people became impatient (“short”) because of the way. ו וַיְשַׁלַּח יְהוָה בָּעָם, אֵת הַנְּחָשִׁים הַשְּׂרָפִים, וַיְנַשְּׁכוּ, אֶת-הָעָם; וַיָּמָת עַם-רָב, מִיִּשְׂרָאֵל. 6 And the LORD sent fiery serpents among the people, and they bit the people; and much people of Israel died. ז וַיָּבֹא הָעָם אֶל-מֹשֶׁה וַיֹּאמְרוּ חָטָאנוּ, כִּי-דִבַּרְנוּ בַיהוָה וָבָךְ–הִתְפַּלֵּל אֶל-יְהוָה, וְיָסֵר מֵעָלֵינוּ אֶת-הַנָּחָשׁ; וַיִּתְפַּלֵּל מֹשֶׁה, בְּעַד הָעָם. 7 And the people came to Moses, and said: ‘We have sinned, because we have spoken against the LORD, and against thee; pray unto the LORD, that He take away the serpents from us.’ And Moses prayed for the people. ט וַיַּעַשׂ מֹשֶׁה נְחַשׁ נְחֹשֶׁת, וַיְשִׂמֵהוּ עַל-הַנֵּס; וְהָיָה, אִם-נָשַׁךְ הַנָּחָשׁ אֶת-אִישׁ–וְהִבִּיט אֶל-נְחַשׁ הַנְּחֹשֶׁת, וָחָי. 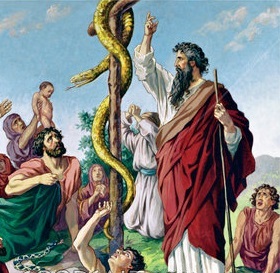 9 And Moses made a serpent of brass, and set it upon the pole; and it came to pass, that if a serpent had bitten any man, when he looked unto the serpent of brass, he lived. What’s with the snake? I had to go back finally check what does nachash (“snake”) means. The word shares its root with “lenachesh” (to guess but also as in divination), nichush (guess, as in a game), nechoshet (copper), and Nachshon (prince o the tribe of Judah). How do all these connect?? We all remember the first snake’s appearance who introduces death to the world; not just physical death, but finality, end, stalling the flow of life; separation in the truest connection there can be. The Children of Israel complain, their “soul is short”, but unlike other times, when their complaints have a point – there is no bread or water, and they eventually get what they ask for – here they “loath this light bread”. The bread became flavorless, meaningless. It started feeling “light” (from kal), like it’s nothing. Meaning, there is bread; it’s just not up to par. They want an upgrade, taking the good they receive for granted. Unlike the time when Miriam was sick, this time, Moses’ prayer doesn’t help. But neither does a stick with a snake on top. Because the nachash (snake) stands for everything uncertain, indecisive, squiggly, hard to grasp, sneaking away. The rest of the words? Nichush, guessing – is a… well, a guess, also uncertain. Divination is unreliable and even copper – the metal this snake on the stick is made of – is an especially soft and malleable metal. What does help is the focus and looking upward. We’re asked to consciously pick up our heads, look up and attach ourselves to what is steadfast, life giving and eternal; to not let our soul be “short”; to stay focused.